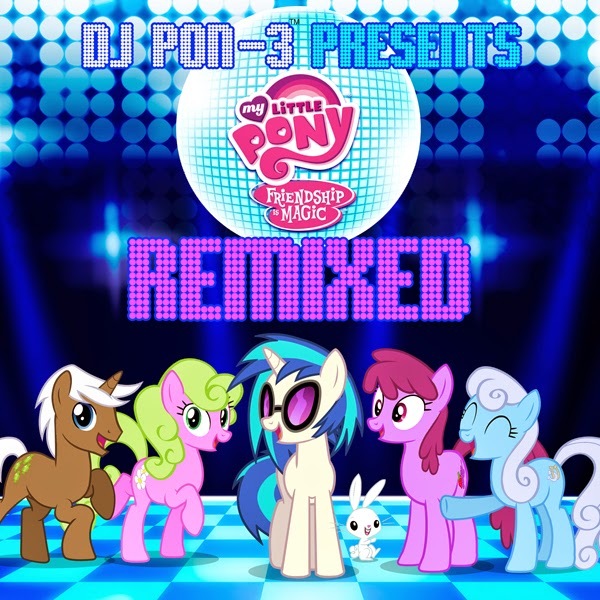 Lakeshore Records and Hasbro, Inc. are releasing the forthcoming DJ PON3 PRESENTS MY LITTLE PONY: FRIENDSHIP IS MAGIC REMIXED digitally and on CD June 23, 2015. Daniel Ingram’s beloved original songs are remixed by some of the top talent on the scene, including Faust & Shortee, Arkasia, Rubicon 7, Heavygrinder and more. The album was produced by Justin Lassen, who worked with all of the artists for the recording. Talented artists from all over the world came together under the direction of Justin Lassen to put their spin on the beloved sounds fans know and love from the beloved animated series. The power of the music from My Little Pony: Friendship is Magic has started to resonate in the dance and EDM scene, so artists including Feint, Buddygirrl, Hollidayrain, Daisy O’Dell, I Am Orange, Acid Paradox and others signed up to work their magic. One of the first people to be considered for this project was DJ Shortee who is considered by many to be a rare breed of technical diversity and musical prowess, making her one of the most sought after DJs worldwide. Her counterpart, Faust, is also a force to be reckoned with having attracted licensing features with MTV, NBC, CNN, the X-GAMES and ESPN. Together the pair’s turntable knowledge and on-stage chemistry enables them to get listeners lost in the music by blending different elements magically together to take you on a bumping journey. HeavyGrinder has captured the attention of audiences in Ibiza, Korea, Mexico, Coachella, EDC Las Vegas, and more. She now tours the U.S. playing direct support or headlining with some of the biggest DJ/producers to date. Rubicon 7 (aka R7) is an electronic duo consisting of a male and female counterpart. They have experienced international success with releases in the U.S., Spain, Brazil, Sweden and the U.K. with their hit "Make Me Feel." Most notably, the duo released their first soundtrack for the film MAY IN SUMMER at the 2013 Sundance Film Festival. The consummate creator, Lassen is credited with a number of full-length recordings under various guises since he began his career at the age of 15. As Omnicron, a brooding electronica project with cinematic undertones, Lassen released 11 albums through a fledgling MP3.com, quickly gaining notoriety as a musical prodigy with a penchant for classical composition. Next to break through was the industrial rock outfit Digital Dirt Heads, which featured Lassen in a multi-instrumentalist, Trent Reznor-like role, writing and producing hard-edged material with the occasional collaborative element. But it was 2003 that saw Lassen’s star rise to new heights with his dark chamber orchestral release And Now We See But Through A Glass Darkly. Lassen has been a long time fan of electronic music and has experienced success over the last decade remixing for the likes of Madonna, Garbage, The Killers, Lady Gaga, Lenny Kravitz, Nine Inch Nails, Linkin Park, Evanescence, and more. Lassen has also contributed music to the Lakeshore Records soundtracks for I FRANKENSTEIN and UNDERWORLD. His production talents have been utilized by high profile firms - including iZotope, Cakewalk, Intel, Sony, Konami, and Interplay - making the connection with Hasbro a perfect match. The animated series “My Little Pony Friendship is Magic,” produced by Hasbro Studios and currently airing on the Discovery Family channel in the U.S., follows a colorful cast of pony friends as they embark on a journey of friendship, learning what it means to be a good friend and understanding what makes each person unique and special. Follow the new season of My Little Pony: Friendship Is Magic on Twitter using #MLPSeason5 or on Facebook at www.Facebook.com/MyLittlePony. I got nothing, I was weirdly excited to see this come up in the mailbox... not really sure what to except and once I started to listen. Well uhm, yeah!